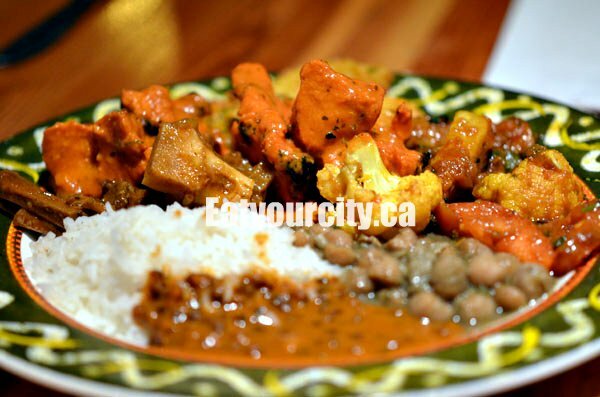 Eat Your City: Khazana - tasty curries, tandoori butter chicken and the naan... oooh the naan! Khazana - tasty curries, tandoori butter chicken and the naan... oooh the naan! With an empty tummy and a craving for something savory, yet comforting, we head over to Khazana with thoughts of butter chicken, tandoori fish and naan bread dancing through our heads. We step into a richly burnished copper and warm wood decorated dining room with a cheery fireplace in the centre. Customers have a peek of the tandoori ovens at the back of the restaurant, with the chefs occasionally using ridiculously long hooks to fish out freshly baked naan breads, tandoori chicken and the like. The air is redolent with the scent of warm spices, cream and other good things, and we were seated quickly. Service was efficient, though we went with the lunch buffet as we were told the kitchen would take a while to prepare items from the dinner menu. It also meant unlimited naan bread.. woohoos! We normally avoid buffets as we tend to overeat and they always conjure an image of lukewarm food languishing in chafing dishes. Thankfully, at Khazana's this was not the case. 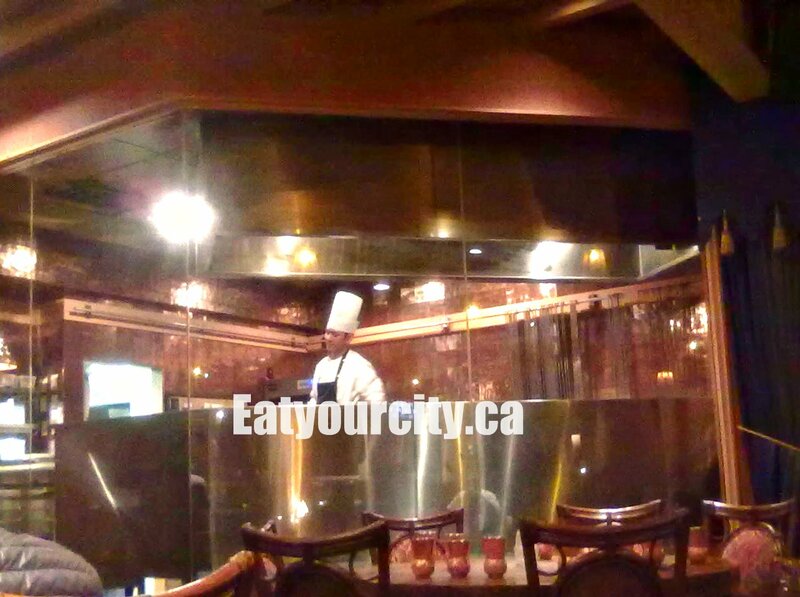 The kitchen at regular intervals topped up buffet items, with the management keeping a close eye on popular dishes that diminished at an astonishing speed. 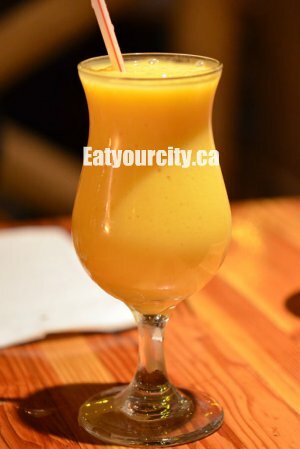 Not being new to this restaurant, we order mango lassi. It serves two purposes: its a delicious, cool and light mango yogurt smoothie, AND it work wonders to cool your palate down as you work through the multitude of spices and layers of spicy heat we're bound to encounter throughout our meal. Fried Fish Basa fillets are lightly coated in a dusting of seasoned flour and fried to a nice moist tender. The seasoned thin crust packs a light spicy hit. Karal Pander Though its just cottage cheese cubes cooked with peppers and spices, this item packed a surprising amount of flavor and creaminess. Chef's Vegetables Cooked in secret spices, these vegetables are tender crisp and have a warmth imbued to them from the spices. Mmmm. Gobhil Birbali We needed a serving of veggies, and this simple spiced cauliflower item hit the spot. Chana Pindi These simple chickpeas cooked in the Chef's own masala are amazing. So simple, but sooo rich, earthy, spicy and sooo good! Daal Khazana Again, a super simple dish of black lentils simmered overnight in spices... delicious! Goat Rogan Josh Goat, being a bit on the gamey and tough side is stewed to tenderness in this goat curry. Just watch out for the bone bits. Basmati Rice Perfect for rounding up all the various sauces. Yum! Now we didn't forget the unlimited naan bread (only at lunch, dinner is by the platter). I swear I could sit all day and eat freshly baked naan. Tender soft, warm out of the tandoori oven with a slight smokiness, these large slabs of thin naan with a slightly chewy texture is awesome for wrapping/scooping up items from your plate, or for getting every last drop of yummy sauce from your plate. Nom! 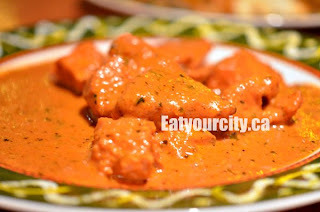 Now we definitely did not forget the butter chicken. Buttaaaaaa chicken! Butter, chicken, cream, a touch of tomatoes, spices, butter and more butter. Heavenly. 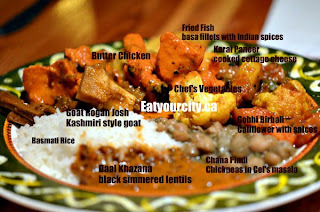 I'll admit it, I'm totally biased because I love butter chicken. Especially when I don't have to wrangle in the kitchen to get the spices - cinnamon, garam masala, turmeric, saffron, ginger, cumin, lime leaves, bay leaves, garlic, shallots, onions and all the rest into a wonderful pot of yumminess. 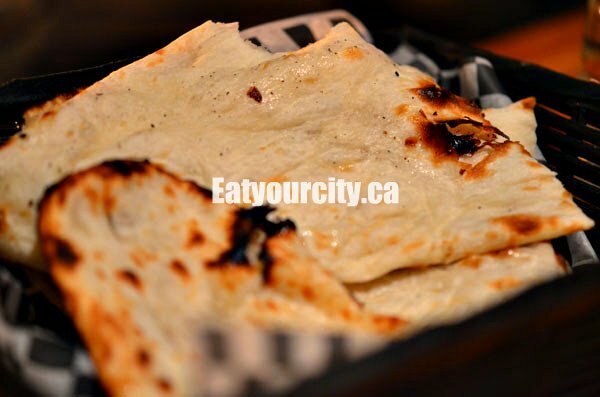 Add fresh naan bread = Mmmmmm! For those with visions of sugar plums, fear not, for there is plenty of sweets to make any sweet tooth ache. For dessert, there is a good selection of cut up fruit - watermelon, cantaloupe, honeydew, and strawberries. 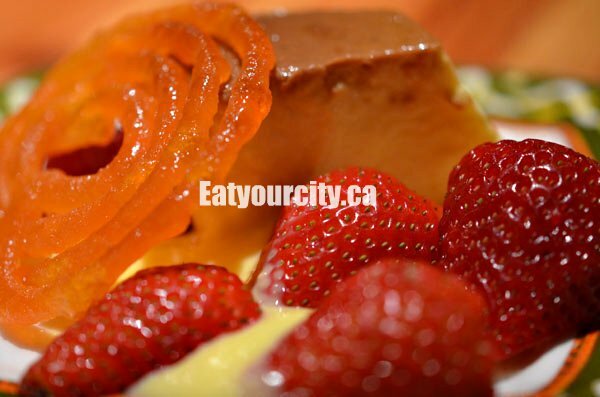 You can garnish it with a rich and creamy mango cream goo, or try their traditional desserts which include the Jalebi, a spiral fried dough sweetened with syrup (normally served during celebrations in India), or their Caramel Flan, a smooth and rich custard laced with a generous dousing of syrup. We ran out of room for their Gulab Jamun, sticky sweet fried doughballs drenched in a cardamon flavored syrup. Overall, a great place to try various curries - each one has their own distinctive flavors, though if you try too many, the saffron, cinnamon, cardamon, masala and various chilies start to play tricks with your tongue. Wait, I just needed to take a sip of mango lassi to clear my palate. Heehee! So, bring your appetite for some delicious curries, butter chicken and fresh naan. We had to totally waddle out after our meal. Food coma time! Zzzzzz.